The RioRand CREE LED Bike Light offers a sleek and durable product that produces extreme brightness for navigating dark areas. The body is manufactured from an aluminium body that offers water proofing properties and withstand harsh weather conditions. The lights are environmental friendly and powered by Li-ion batteries which are rechargeable via USB. This light will ensure you are safe by making you visible at all time on the road. 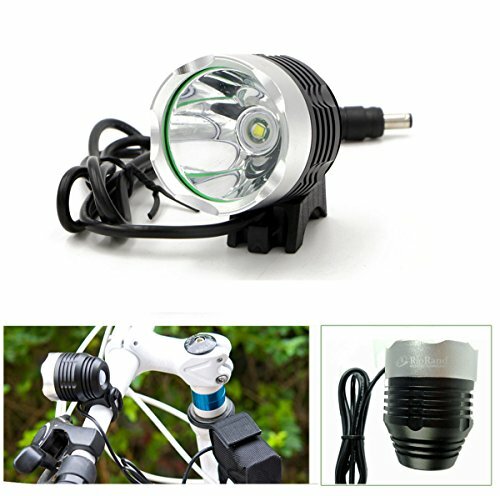 Has a dual function of both a headlight when attached to a bike and a flashlight when detached. Powered by ultra-bright LED bulbs made from the CREE XM material. Brightness adjustable in four settings modes of Normal, Strong, weak and strobe. Battery capacity rated at 4400mA to offer long usage on a single charge and it is rechargeable. The battery is encased in a water proof aluminium casing for toughness and durability. The RioRand CREE LED Bike Light is a multi-purpose light product that functions very well as both a headlight and a flashlight. It is manufactured from a tough aluminium material that ensures durability. The light outputs bright lights, however it doesn’t produce a divergent beam, instead the light focuses on a single spot. The batteries come cheaply assembled and always get hot quickly. The button for adjusting the power setting is well-lit and very visible, which is a nice feature. This product is super light at just one hundred and four grams while the batteries weigh one hundred and ninety grams. For a very cheap price, this light comes with everything you need for your lighting solution when biking at nights plus installation is in a breeze and you don’t need any tools.